Content parser is an advanced version of a Content filter, which was described in the previous topic. It also works with the content received by the HTTP, FTP, SFTP, Telnet, SSH and Console monitors. But it doesn't simply searches for some text strings. Content parser checks the content against the specified Parsing Template and extracts pieces of content to a named variables. Then it evaluates the Success Criteria boolean expression which can compare these variables between each other or some constant values. If this expression returns "false", ProtoMon considers that the monitor check failed, and triggers the corresponding alerts. You can include any number of variables to the template, just make sure to separate them with some text, so ProtoMon can define the boundaries of each variable. Opened and closed double curly brackets without the variable name inside means "any text" and allows you to skip useless parts of the content. 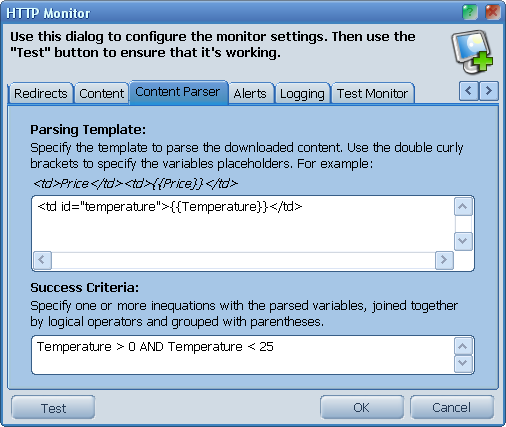 The parsed variables with values will be printed to the monitor check log, so you will easily know either your template extracts needed parts of content or not. Please note, that on the very first monitor check, when there is no saved old value yet, ProtoMon will consider that old and new values are equal.